All of this would be more believable except for one thing. You see, America ALREADY has Obamacare in one state. It’s called ROMNEYCARE. It’s identical to most aspects of Obamacare, and it MANDATES CARE FOR CONTRACEPTION. In other words, if Mr. Green and his allies got SCOTUS or the Congress to overturn Obamacare, any employees that Mr. Green had in Massachusetts would still have access to all those nasty pieces of contraception Mr. Green doesn’t like. This is important because this store in Massachusetts is not some grandfathered-in surprise. 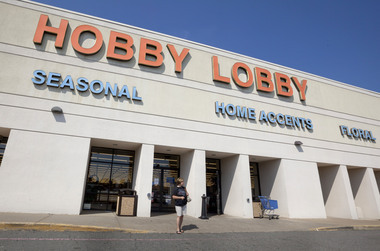 Hobby Lobby didn’t wake up some sleepy morning in 2006 and find that they were covering emergency contraception. Nope, Hobby Lobby OPENED THEIR FIRST STORE IN MASSACHUSETTS (Holyoke) THIS year. It’s on their website. It’s unfortunate, because in certain ways, Hobby Lobby treats their employees better than most in retail–they pay lots more than minimum wage, for example. And they have been getting raises on a regular basis during this recession. But let’s be clear: Mr. Green’s chance to ‘make a statement’ about covering emergency contraception was when the planning was going on for a store in Massachusetts. If we are to believe Mr. Green’s threat, he should first pull out of the Bay State. And he might tell us whether he voted for Willard back in 2012. It was under Willard (who now claims he didn’t plan for Romneycare to work out this way) that religious exemptions were mostly brushed aside for the Massachusetts healthcare system. Ball’s in your court, Mister Green. Convince us this isn’t about the Benjamins, that you aren’t trying to impress your customers who think the POTUS is some socialist Muslim. Explain why you can pay for employee emergency contraception in Massachusetts but not anywhere else. Because it’s clear you aren’t being entirely forthcoming on the issue. A good xian shouldn’t bear false witness, right? Why does everybody change the argument. Hobby Lobby has health care for their employees. but calling abortions contraception? Please look up those two words. One means it is used to prevent pregnancy. The other stops a beating heart.